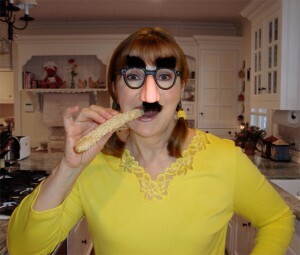 12 Comments on "Homemade breadsticks"
would you do it? I could see you having celebrity guests, comics, singers people from your blog on as guests to help you prepare the meal…OMG! What FUN! “Someone’s in the Kitchen with Jenny”… I need to be a marketing agent for them! Another gal that keeps random substance in her purse, eh? I LOVE THAT! I had to ‘bust out’ my mini-pepper grinder from my hand bag at lunch earlier, and when my friend couldn’t find any moist towelettes quick enough; I had plenty to pass around the table. I bet if I looked hard enough; I could find Hoffa in there! I am thinking you just might be my sister by another mister! Love your look and I wanna try those breadsticks! I bet this would also be good with some melted butter with cinnamon on it. Jenny a NEW VIDEO WOOT!!!! Thank you hon. I love learning from you and the videos so much, you make it fun for us too.